Guy Rose was born in San Gabriel, California on March 3, 1867, the seventh of eleven children. He was the son of J. L. Rose, a former senator and large Southern California landholder and rancher. When Guy was a young boy, he was shot in the jaw in a hunting accident. While he was recuperating, he developed an affinity for drawing. 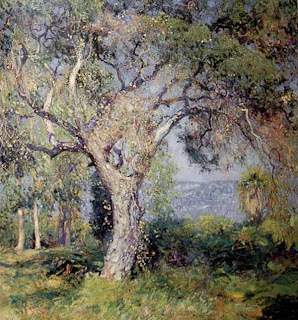 Guy Rose moved to San Francisco after high school. In San Francisco, Rose began his formal art training at the School of Design under Virgil Williams and Emil Carlson. In 1888, he studied in Paris at the Academie Julian under Jean-Joseph Benjamin Constant, Jules Lefebvre and Jean Paul Laurens. In 1894, Rose received an honorable mention at the Paris Salon—the first California painter to do so. In 1989, Rose took time from his studio salon paintings to travel in the countryside and paint outdoors, making trips north of Paris to Crecy-en-brie and Giverny. It was in Giverny that Rose came into contact with Monet and the circle of artists that had grown around the famous French painter. The trip was to have a lasting effect on Rose’s style. The artist slowly embraced Impressionism with its looser brushwork and brighter color. Returning to New York City in the mid-1890s, Rose taught at the Pratt Institute and created illustrations for such magazines as Harper’s, Scribner and Century. Rose had suffered with periods of sickness for years and was diagnosed with lead poisoning. His symptoms included swollen hands, loss of vision, debilitating abdominal pain and paralysis. The effects limited his ability to paint—sometimes for years. In 1899, Rose traveled back to France and bought a cottage in Giverny. His disease in remission, Rose resumed his painting and produced many fine canvases in the Impressionist style. In 1912, Rose returned to New York. Two years later, he made his final move to Pasadena. He taught art, and then later served as Director of the Stickney School of Art. He painted scenes of the Sierras and Laguna Beach, having successful one man shows in Los Angeles and Pasadena. 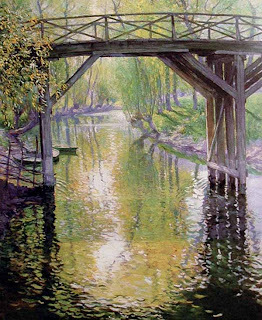 Beginning in 1918, Rose took painting trips to Carmel. In 1921, he suffered a stroke that left him paralyzed. Rose died on Nov. 17, 1925, at the early age of 58.